^ (MosNews)U.S. Senator Urges Russian Peacekeepers’ Withdrawal From Georgian Breakaway Republics..
^ Commission to Work on S.Ossetia Status. Civil Georgia 13 July 2007. ^ Reuters, UPDATE 1-EU faces tough test of unity on Russia at the Wayback Machine (archived June 3, 2010), Forbes, 31 August 2008. ^ Damien McElroy. South Ossetian police tell Georgians to take a Russian passport, or leave their homes. The Daily Telegraph, 31 August 2008. ^ Yuschenko, Saakashvili open new building of Georgian Embassy in Kyiv, Interfax-Ukraine (November 19, 2009). ^ Council of Europe Secretary General calls for talks instead of "referendum" in the Georgian region of South Ossetia. Council of Europe Information Office in Georgia. Retrieved on 13-09-2006. The country's principal university is South Ossetia State University in Tskhinvali. After the Russo-Georgian War in 2008, education officials attempted to place most college-bound students from South Ossetia in Russian post-secondary education institutions. Russia planned to spend 10 billion rubles in the restoration of South Ossetia in 2009. Following a war with Georgia in the 1990s, South Ossetia struggled economically. South Ossetian GDP was estimated at US$15 million (US$250 per capita) in a work published in 2002. Employment and supplies are scarce. Additionally, Georgia cut off supplies of electricity to the region, which forced the South Ossetian government to run an electric cable through North Ossetia. The majority of the population survives on subsistence farming. Virtually the only significant economic asset that South Ossetia possesses is control of the Roki Tunnel that used to link Russia and Georgia, from which the South Ossetian government reportedly obtains as much as a third of its budget by levying customs duties on freight traffic. 2009 Population Estimate: During the war, according to Georgian officials, 15,000 Georgians moved to Georgia proper; South Ossetian officials indicate that 30,000 Ossetians fled to North Ossetia, and a total of 500 citizens of South Ossetia were killed. This left the estimated population at 54,500. However Russia's reconstruction plan involving 600 million dollars in aid to South Ossetia may have spurred immigration into the de facto independent republic, especially with Russia's movement of 3,700 soldiers into South Ossetia, in order to prevent further incursions. RIA Novosti places the population of South Ossetia at 80,000, although this figure is probably too optimistic. 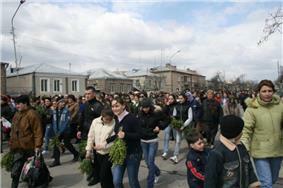 Palm Sunday procession in Tskhinvali, April 2009. The republic held its fourth presidential election in November 2011. Eduard Kokoity was not eligible to run for president for a third time, per the constitution. Anatoly Bibilov, supported by Russian authorities and Alla Dzhioeva, backed by main South Ossetian opposition figures, got about a quarter of the vote each and participated in the run-off vote. A run-off was won by Dzhioyeva on November 27, 2011, but the results were invalidated by the Supreme Court of South Ossetia. Leonid Tibilov won the 2012 election over David Sanakoyev after a run-off. said that "None of the two alternatives do we consider legitimate [in South Ossetia]." An EU fact-finding team visited the region in January 2007. Initially, Sanakoyev's administration was known as "the Alternative Government of South Ossetia", but during the course of 2007 the central authorities of  On 10 May 2007 Dmitry Sanakoyev was appointed head of the provisional administrative entity in South Ossetia. The People of South Ossetia for Peace was founded in October 2006 by ethnic Ossetians who were outspoken critics and presented a serious opposition to secessionist authorities of Eduard Kokoity. President Eduard Kokoity voting in the 2009 elections. Until the population transfers on a large scale. In November 2009, during the opening ceremony of a new Georgian Embassy building in Mikheil Saakashvili stated that residents of South Ossetia and Abkhazia could also use its facilities: "I would like to assure you, my dear friends, that this is your home, as well, and here you will always be able to find support and understanding". Landscape in South Ossetia's Dzhava District. The South Ossetian and Russian presidents signed an "alliance and integration" treaty on 18 March 2015. 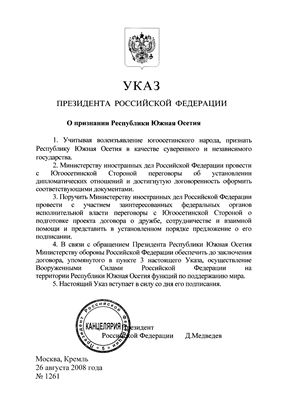 The agreement includes provisions to incorporate the South Ossetian military into Russia's armed forces, integrate the customs service of South Ossetia into that of Russia's, and commit Russia to paying state worker salaries in South Ossetia at rates equal to those in the United States and European Union said they would not recognise it. On August 30, 2008, Tarzan Kokoity, the Deputy Speaker of South Ossetia's parliament, announced that the region would soon be absorbed into Russia, so that South and North Ossetians could live together in one united Russian state. 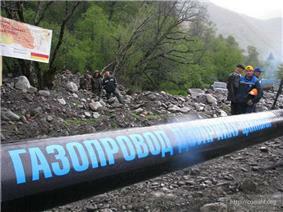 Russian and South Ossetian forces began giving residents in North Ossetia in the Russian Federation. In April 2007, Georgia created the President of Georgia as the Head of South Ossetian Provisional Administrative Entity. Parallel to the secessionist held referendum and elections, to Dmitry Sanakoyev as the alternative President of South Ossetia. The alternative elections of Sanakoyev claimed full support of the ethnic Georgian population. The Tbilisi. The European Union, OSCE and NATO condemned the referendum. South Ossetia's climate is affected by continental climate. The term Likhi Range. The overall region can be characterized as being made up of various, interconnected mountain ranges (largely of volcanic origin) and plateaus that do not exceed 3,400 meters (11,155 ft) in elevation. Nearby 30% are located within Georgia which South Ossetia forms a part of. South Ossetia covers an area of about 3,900 km2 (1,506 sq mi), separated by the mountains from the more populous North Ossetia (which is part of Russia) and extending southwards almost to the above sea level, and its highest point is Mount Khalatsa at 3,938 m (12,920 ft) above sea level. The Greater Caucasus Mountain Range forms the northern border of South Ossetia with Russia, and the main roads through the mountain range into Russian territory lead through the Russian military in the 2008 South Ossetia war because it is the only direct route through the Caucasus Mountains. Relief map of South Ossetia. Map of South Ossetia (November 2004). The monument in Tskhinvali to the victims of the Georgian-Ossetian conflict. A school in Tskhinvali after the fighting during August 2008. Since the war, Georgia has maintained that  In response, the Georgian government cut diplomatic relations with Russia. Russia recognised Abkhazia and South Ossetia on 26 August. In five days of fighting, the Russian forces captured Tskhinvali, pushed back Georgian troops, and largely destroyed Georgia’s military infrastructure using Gori, Senaki, and Zugdidi. After the heights around Tskhinvali were secured, Georgian troops with tanks and artillery support entered the town. Georgian shelling left parts of Tskhinvali in ruins. According to Russian military commander, over 10 Russian peacekeepers were killed on 8 August. That day Russia officially sent troops across the Georgian border into South Ossetia, claiming to be defending both peacekeepers and South Ossetian civilians. Russia accused Georgia of committing "genocide". Russian authorities claimed that the civilian casualties in Tskhinvali amounted up to 2,000. These high casualty figures were later revised down to 162 casualties. On 7 August, Georgian President Mikheil Saakashvili, ordered a unilateral  The official reason given by Tbilisi for this was to "restore constitutional order" in the region. Following the 2003 Adolf Hitler's quotation from 1932: "Only through the force of weapons" could lost territory be regained. On 24 June 1992, Shevardnadze and the South Ossetian government signed the Organization for Security and Cooperation in Europe (OSCE) set up a mission in Georgia to monitor the peacekeeping operation. From then until mid-2004 South Ossetia was generally peaceful. As a result of the war, approximately 1,000 died and about 100,000 ethnic Ossetians fled the territory and Georgia proper, most across the border into North Ossetia. A further 23,000 ethnic Georgians fled South Ossetia and settled in other parts of Georgia. Many South Ossetians were resettled in uninhabited areas of North Ossetia from which the Ingush had been expelled by Stalin in 1944, leading to conflicts between Ossetians and Ingush over the right of residence in former Ingush territory. The Georgian Supreme Council adopted a law barring regional parties in summer 1990. 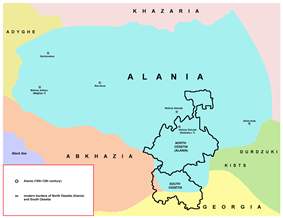 This was interpreted by Ossetians as a move against Ademon Nykhas and led to Ossetians proclaiming South Ossetia as the South Ossetian Democratic Republic on 20 September 1990, fully sovereign within the Union of Soviet Socialist Republics (USSR). Ossetians boycotted subsequent Georgian parliamentary elections and held their own contest in December. Tensions in the region began to rise amid rising nationalism among both Georgians and Ossetians in 1989. Before this, the two communities of the South Ossetian Autonomous Oblast of the Georgian SSR had been living in peace with each other except for the 1918-1920 events. Both ethnicities have had a high level of interaction and high rates of intermarriage. 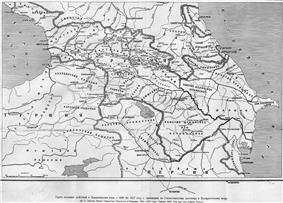 Historical Ossetia in North Caucasus did not have its own political entity before 1924, when the North Ossetian Autonomous Oblast was created. 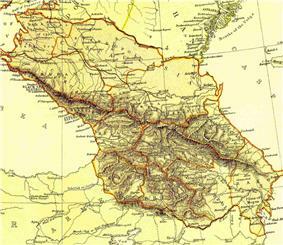 Ossetian migration to Georgian areas continued in the 19th and 20th centuries, when Georgia was part of the Russian Empire and Ossetian settlements in Trialeti, Borjomi, Bakuriani and Kakheti emerged as well. Map of Georgia highlighting South Ossetia (purple) and Abkhazia (green). Topographic map of South Ossetia (Polish transcription). Fragment of the historical map by J. H. Colton. 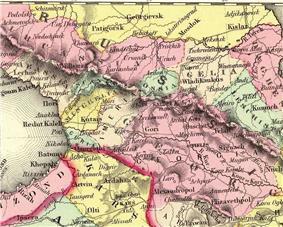 The map depicts Caucasus region in 1856. Modern South Ossetia is not labeled. 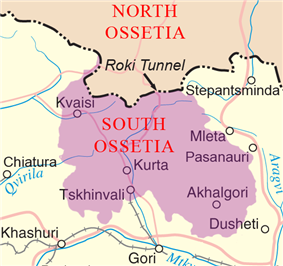 Modern North Ossetia is labeled as "Ossia". Map of the territory of modern South Ossetia within medieval Alania (10th–12th century), according to Ossetian historian Ruslan Suleymanovich Bzarov. South Ossetia, Transnistria, Nagorno-Karabakh, and Abkhazia are post-Soviet "frozen conflict" zones. In the wake of the 2008 South Ossetia War, occupied by the Russian military. South Ossetia relies heavily on military, political and financial aid from Russia. Russia does not allow European Union Monitoring Mission monitors to enter South Ossetia. South Ossetia Russia–Georgia war, during which Ossetian and Russian forces gained full de facto control of the territory of the former South Ossetian Autonomous Oblast.